Barely a year from it’s opening, Halifax Fan’s Shenzhen plant is in full production. Fans are being manufactured not only for Chinese customers but also for customers in Denmark, Singapore, Norway and the UK. All of the fans built in Shenzhen are designed in the UK and are manufactured to full UK specifications and designs. In quality terms the Chinese factory is a mirror of the Brighouse plant and is now fully audited twice annually, by BSI in China, to BSI EN ISO 9001:2000 and is fully supported by regular visits from the Brighouse engineering and manufacturing staff. The new factory has just completed an order for 12 fans for Danish spray dryer manufacturer Anhydro. The 12 high specification fans, some required to run at high temperatures, range in size from 30 to 155cms. 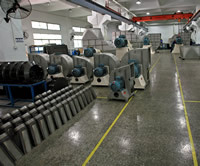 For efficiency reasons, the fans were all sized exactly to Anhydro’s specification and were fabricated from locally obtained fully certificated 316 stainless steel, fully pickled and passivated and were delivered on time complete with anti-vibration mounts, flexible couplings, motors and height adjustable baseframes. The larger units were fitted with Halifax own bearing units ensuring extended lifetimes and reduced downtime. As a consequence Anhydro has placed a second substantial order that will also be built in Shenzhen. German chemicals company Bayer has also purchased a fully ATEX certified spare fan for its plant in Shanghai. The fan, which features a special dye penetrant tested impeller, was fitted with flexible bellows to deal with internal pressure differentials and was pressure tested to 2 bar prior to despatch. With the Chinese plant fully operational and proven to their demanding quality standards, Halifax now has the flexibility and build capacity to meet customer’s needs for timely delivery on any order, be it for China, the Far East or even for customers in the EU.